How many times have we labelled a play ‘thought provoking’? 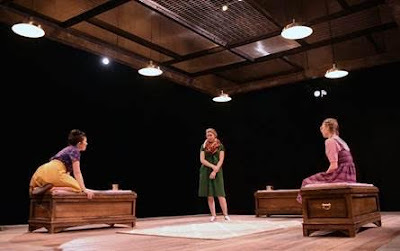 The current production at the Centenary Stage Company is a perfect example of a play that will generate discussion far beyond the drive home…at least that was our experience last night and into today. Michelle Kholos Brooks’ Hitler’s Tasters is making its world premiere this weekend. Ms. Brooks was introduced, at the World War Two museum in Indiana several years ago, to the little know tale of Hitler’s Tasters. Specifically about a German woman, now in her late nineties, who spent most of the World War II period in the service of her country, and beloved Führer, not in any combat or normal support role but as a taster for Hitler…to literally die for the Führer (a link to her story is below). Making this world premiere particularly special are the performances of the four young women. 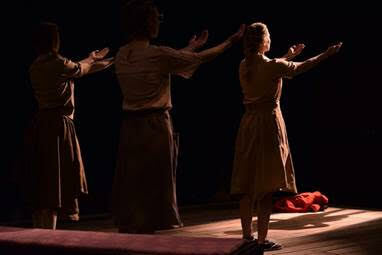 Director Sarah Norris has cast a group of remarkably talented women: Emaline Williams is the crafty Hilda; Jenny Robbins is the calm peacemaker Liesel; Brianna Morris is the somewhat naïve Anna; and Ally Bergstrom is the innocent newcomer who thinks she has been recruited to serve her Führer for her typing skills. Yes, it is a thought provoking dark subject, yet it is easy to fall in love with these impressive young women and the unique story. Director Sarah Norris’ production staff includes: stage manager Danielle Constance; set design Tim Golebiewski; light design Ed Matthews; sound design Jeff Knapp; technical director Jeff Chase; and costume design Ashleigh Poteat. 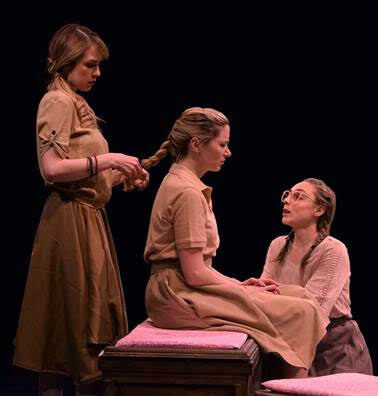 Hitler’s Tasters was selected after a staged reading in the 2017 Women Playwright Series. Catherine Rust is the program director of the CSC Women Playwrights Series. This year’s readings will be April 11, 18 and 25. Further information at www.centenarystageco.org. Hitler’s Tasters runs through April 22 in the Kutz Theatre of the Lackland Performing Arts Center. Remaining performance dates are; Fridays April 13 and 20 at 8pm; Saturdays April 14 and 21 at 8pm; Sundays April 8, 15 and 22 at 2pm; Wednesdays, April 11 and 18 at 2pm and Thursdays, April 12 and 19 at 7:30pm. Tickets are $27.50 for adults on matinee and Friday evening performances and $29.50 for adults on Saturday evening performances. Thursday evening performances are $27.50 for all seats with a buy one / get one rush ticket special when purchased in person at the Centenary Stage Company box office beginning at 5:30pm.The CSC box office is located in the Lackland Performing Arts Center at 715 Grand Avenue Hackettstown, NJ.